I love Korean food; in fact I love all kinds of food. If you are looking for the best Korean Restaurant in Kuala Lumpur, head on to Daorae Korean BBQ Restaurant located in Desa Sri Hartamas. Note that Daorae has a chain of restaurants scattered all over Malaysia and the Klang Valley but my favourite is still the headquarters which is located at Desa Sri Hartamas. Today, I decided to have dinner there and the bottomline, it was a very satisfying dinner. The food was great and the service was excellent — as usual. My cravings for good Korean food is fulfilled by Daorae time and time again. The food here is comparable to those I tasted in Seoul. 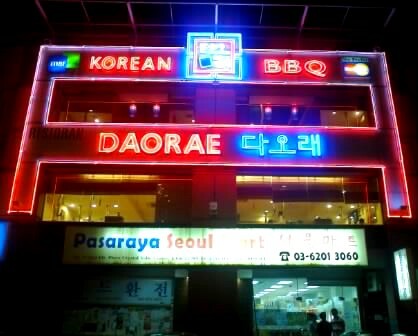 If you are looking for the best Korean restaurant in town, look no further than Daorae Korean BBQ. Geon Bae!! p.s. If you have had good Korean food elsewhere, please leave a note of that restaurant in the comment section below, I would love to give it a try.